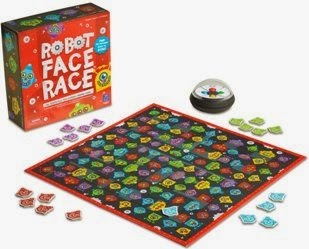 One new amazing game that I wanted to share about today is Robot Face Race by Educational Insights. This is a neat game that can be modified into a quick and easy language activity and our students won't even suspect that they're learning. And of course it would also make a great family game to play at home if you have children of your own. The game supports 2-4 players and is recommended for ages 4 and up. The game board consists of 120 robot heads -- all of which have unique color combinations and none two robots are the same. The object of the game is to be the fastest player to find a robot with a specific color combination. 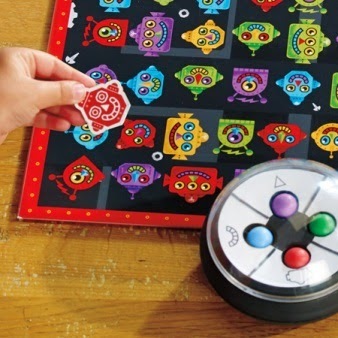 The game also comes with a "robot randomizer", a plastic contraption picturing robot face parts and small colored balls that are covered by a clear bubble. This clever design allows players to shake the randomizer so that each ball rolls towards different face part. Players then have to analyze the color combination and match the colors for each face part to find the corresponding robot on the board. The first player to spot the robot face puts a scoring token on top of it. If their guess is correct, they get to keep this token; if their guess is incorrect, they sit out the next round (which is a good rule for our students with impulsivity). The first person with five tokens is the winner. Describing: You can use the different robot faces to target describing goals. One student could describe a specific robot (e.g., "My robot has a rectangular blue head with three green eyes, a yellow triangular nose, and a smiling purple mouth") while the other students have to listen and find the match. Following directions: You can work on listening comprehension by giving directions, such as: "Place a token underneath a yellow robot / between a blue and a green robot," etc. 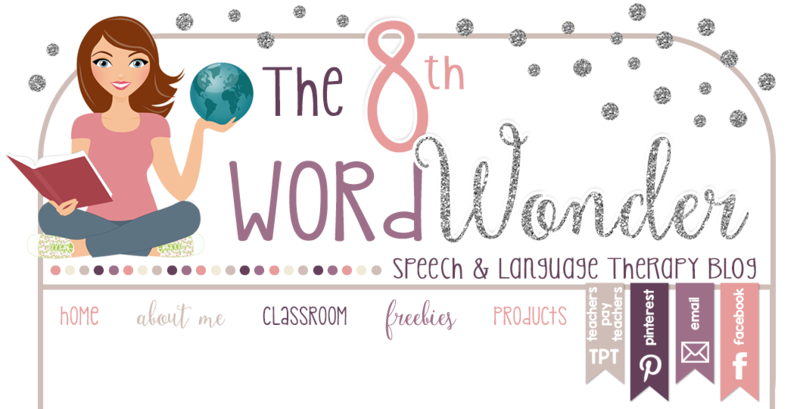 The versatility of this game is what makes it so great for use in Speech therapy. Another reason I love this game is because it requires no batteries!